The BIC hosted a series of Deep Learning workshops organized by Santiago Paiva (Hoge lab) and Dr. Robert Brown (Arnold lab) on January 19th and 26th. Sessions were divided into lectures and hands-on segments. 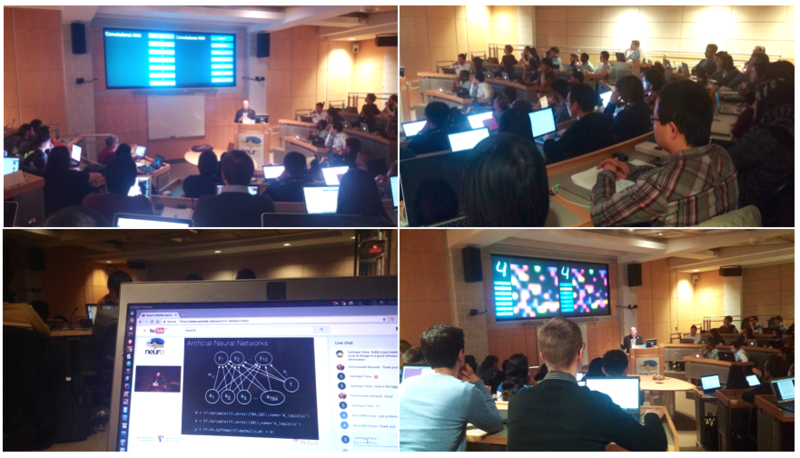 Participants were introduced to the basics of Deep Learning during the first, theoretical half, and then they continued with a hands-on workshop using Google’s TensorFlow. Session I discussed background theory for machine learning, graph computation, artificial neural networks (ANNs) and the basics of deep learning. Perceptron-type ANNs and an introduction to convolutional networks were also covered in the first session. Session II covered more advanced convolutional and fully convolutional networks, and ended with a challenge problem that is similar to finding numbers written on a page or identifying street address markers from a passing Google car. “Montreal is becoming a major hub for machine learning. We saw an opportunity to share knowledge with other researchers and to start building a community with a passion for deep learning” states Research Associate Dr. Robert Brown, who led both sessions. More than 85 participants, from undergraduate students to principal investigators, took part in the workshops, coming from the MNI, McGill University, Concordia University, École Polytechnique de Montréal, and the University of Toronto. Both workshop sessions were live streamed via YouTube to an audience of 30 people, with most online attendees from Université Laval in Quebec.